Be a free spirit: I love to re-wear my favorite clothes, and I do it all the time. Sometimes I struggle on Visible Monday to find something in my closet that you all haven’t already seen a dozen times! Today I feel like a Free Spirit, on a gorgeous Florida winter day. This cozy ivory sweater was bought years ago, and I can’t remember where. The back says “Spirit”, so it’s like a complete thought . Just the word “free” brings joy, as most of us are fortunate to live, speak, and dress freely. This was not always so, and we have to stay vigilant to hold onto this precious right. The velvet Goddess skirt is an old favorite too, thrifted at Housing Works in NYC. It’s by Vivienne Tam, one of my favorite designers, and feels wonderful to wear. I’d like it a bit shorter but I don’t want to mess with the art. My funky Cydwoq booties have been around for at least six years. I found them on eBay, and their new styles are swoon-worthy, too. I’m swooning right now for this style. Love the surprise kitties on the back of these tights. Ceramic kitty adds her cat-like approval. Are you feeling like a free spirit? Show us in the link-up. Such a cute outfit! There’s nothing wrong with re-wearing. Some are new and have never seen your pieces before and it provides an opportunity to rework your clothes. And that’s always fun. I love all of these pieces Patti, and putting them together magnifies their fabulousness! 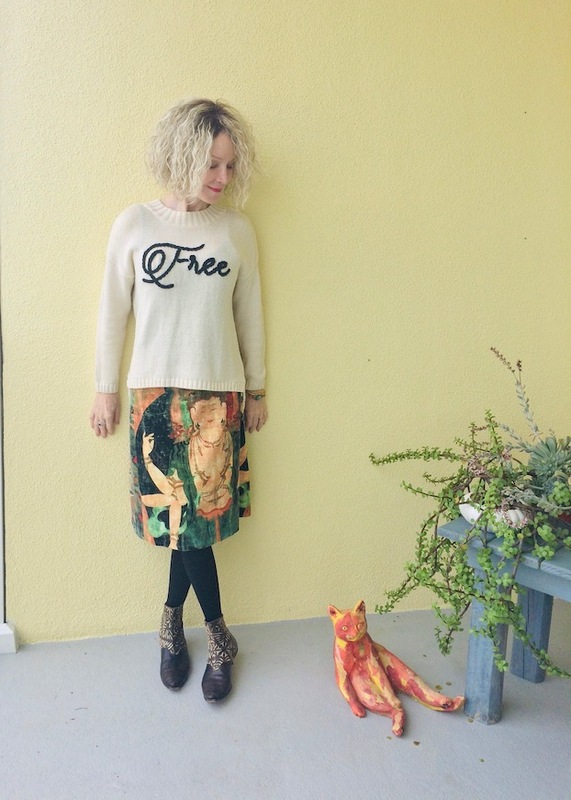 The font on the sweater is charming…and yes to being free! Love that vintage skirt you are wearing. The print is so classy. Also love your free spirit jumper. I am trying to be just that, especially, as I get older – life really is too short. You are turning me onto the vintage. Can’t beat the quality! Thanks so much, Alison! And right you are that life flies by too quickly. Have a lovely evening, xox. I think you need those cat tights too, for your own free-spirited style, Ann! Thanks for coming by, xox. thanks Debbie! Same back to you, and I’m swooning over your big city shots, xox. This sweater and skirt are such great pieces! I love how creative you are with all of your outfits! such a cute and cozy sweater! love it! I love this look—it feels very you! And don’t worry about wearing things repeatedly—it’s always interesting to see how you re-purpose things and wear them in different ways! I saw someone selling this same skirt on Ebay for $200. When you have great pieces it is a shame not to wear them often. These all create such an eclectic, fun outfit. Those tights are a blast! You look awesome, Patti in your free spirit ensemble. It’s altogether an outfit for a true artist. I usually keep the clothing I love for a while too! I try to get the most out of what I buy. I love your skirt and tights! I’m crazy for your sequined skirt, worn with a denim shirt, very cool! Thanks for coming over, xox. Love this Patti! There is nothing better than feeling free, or being a free spirit. Love that message. The skirt is beautiful, wearing art. 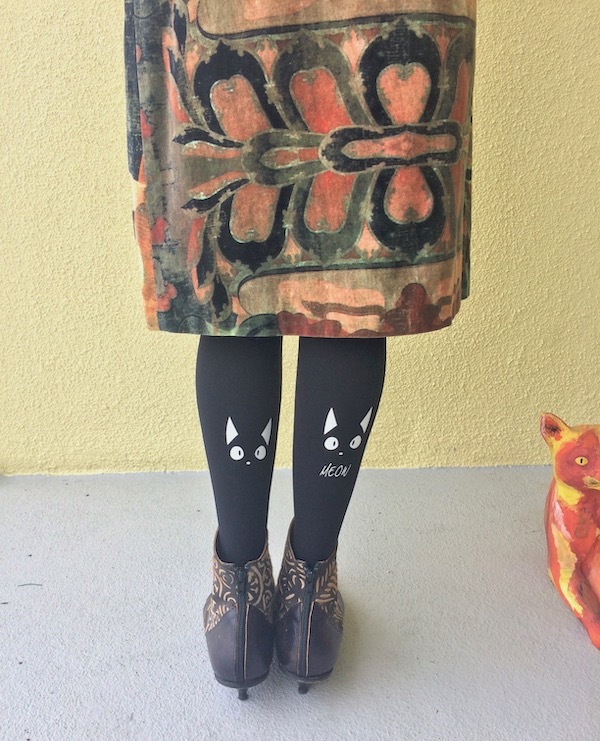 I love those booties, the design is so cool and I always love tights, those kitty ones are so adorable! Now, if you could find me some puppy ones… I am there! You have put such a beautiful and fun outfit together, Patti! Re-wearing and re-mixing clothes gives me so much joy. I love the velvet skirt you’re wearing! It’s a wonderful example of wearing style longer than one season. Too many people shop for the latest trends and don’t realize their closet should be the first place they should be shopping! Love the kitties on the back of your tights! FUN! Come and join me tomorrow on my link up party! thank you Robin, and I love your family-in-jammies pic, you all look so joyful, xox. lovely sweater and lovely words, I totally support that ‘we have to stay vigilant to hold onto this precious right’. Wisdom!. And so lovely print and cool shoes! Love that sweater. It would be great for my teen daughter who’s all about personal freedom and surfing these days. Have a great week. Surfing! that’s a huge local passion here. thanks for linking up, and I love how you’ve styled your new sweater, xox. Those tights are fantastic! What fun! And the skirt is so beautiful, like a painting! Hope to see you at my Fancy Friday linkup party! Thanks, Nancy! I love, love your chic suit! xox. Thank you Maria! I think a “love” sweater is positive and very cool, xox. I am loving your sweater Patti, it is just fabulous! And the skirt as well.Have a wonderful week! thank you, Suzanne! I hope your week ahead is full of joy, xox. Good on you for re-wearing on your blog , it really is the only way to go and sets an example that looking good and you always do is not about continually shopping and wearing new things. Many thanks for hosting Patti. Yes to these multiple messages of freedom and conscientious shopping. Love the artful skirt and spirited graphic sweater. I enjoy shopping at housing works too. I wish I could respond with an unfettered yes to your question..but with the way the world is changing, I appreciate freedom even as I watch it erode in subtle ways. thank you dear Elle, I would love to bump into you at Housing Works some day! Your post today brings tears, and you add the light with your sweet poem. xox. That skirt is gorgeous, and I would love wearing it over and over and over again! You look fantastic, Patti, and kitty tights add to your free-spirited mood. Awww, thanks, Rama, and thank you for linking up. Have a wonderful week, xox. Everything here is artwork in clothing, Patti. Especially those tights—-so cute and such an unexpected surprise!! My stepmom always says that about not wanting to show the same thing on the blog over and over, but I tell her that’s real life, and so relate able!! Hurray for re-wearing old faves! I remember when you got those Cydwoq beauties (Audi introduced me to that brand), and I love that skirt (I have a Vivienne Tam piece too). Love the whole look! Thank you so much for hosting, Patti! That is awesome (that we have been friends for so long!). It was Megan Mae that introduced me to the brand. These shoes have soul. Thanks so much for coming over, xox. That skirt is a work of art! What a beautiful statement piece Patti! Thanks Kellyann! Love, love your satin trousers, xox. 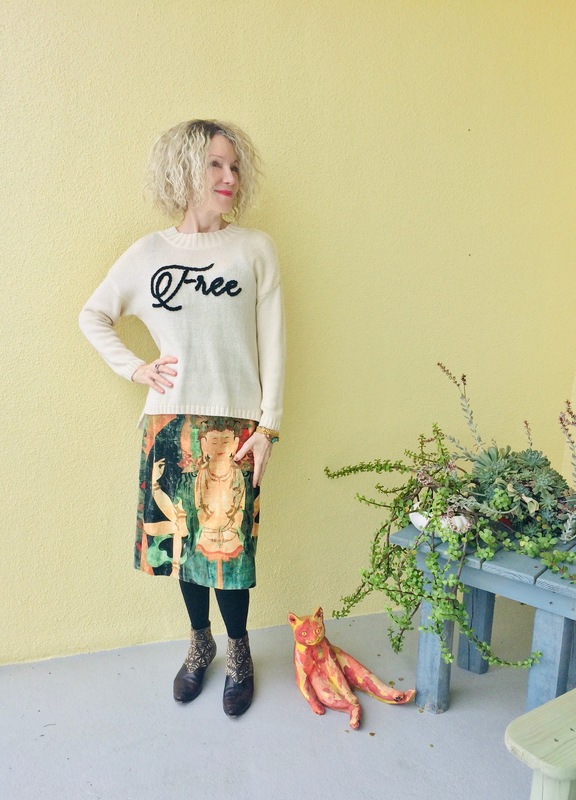 Love the free spirit message you are sending with your outfit! I’m a fan of rewearing, too, and my post this week is also much loved remixed looks. Thank you Di, and thanks for linking up. I really like your animal print re-mixes, very cool! xox. I adore your skirt! I’m going to take a look at that designer. With your black tights, I don’t think you notice that the skirt is a touch longer than you’d prefer. The kitties are too darned cute ;). Agreed, Tiina. Even if I had unlimited funds, buying more stuff would not add to my happiness. And thanks for the kind words, and sweet dreams to you, xox. thank you for all the kind words, Lisa! Have a wonderful week ahead, xox.